That’s where MusicBrainz comes in. Music Brainz is a non-profit corporation that hosts a database of “music fingerprints.” A music fingerprint is like the DNA of a music track. Regardless of the bitrate of the file, the music finger print will remain the same … or at least similar. In the Music Brainz database, each music fingerprint is linked to the accurate track information like the artist name, song name, album title, release date, record label, etc. 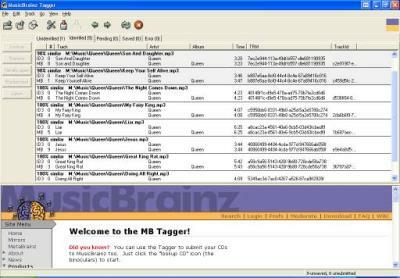 Programs utilize the MusicBrainz database to automatically tag your songs. First, the program creates a fingerprint of an untagged song in your music library. Then it goes online and compares that fingerprint to the entire Music Brainz database. If the similarity percentage is above a certain mark, the program will tag the MP3 file with the ID3 information. If there are many similar fingerprints or the similarity percentages do not reach above that preset mark, it asks you which music fingerprint to use. You can listen to a short clip of the song to verify it as well. What’s great about Music Brainz is that you can also contribute to the database! Registration is not required to obtain track information from the database. But it is required if you want to post your results to the database. Why would you want to do this? You need to do this as a form of giving back to the music community. It will make the database even more comprehensive so that you can help other untagged audiophiles for future generations. Since the Music Brainz database is open to the public there are many programs that you can use to take advantage of this wealth of information. Music Brainz just cannot recommend just one. Choose a program and comment below on your experiences with it! This entry was posted on Thursday, April 12th, 2007 at 1:37 pm	and is filed under Audio and Video, Cool Stuff, Entertainment, Utilities. You can follow any responses to this entry through the RSS 2.0 feed. You can leave a response, or trackback from your own site.